ŽELJKO KHERMAYER: Hi, this is Željko Khermayer, and I’m the CEO of Feelif, and this is your Assistive Technology Update. JOSH ANDERSON: Hello and welcome to your Assistive Technology Update, a weekly dose of information that keeps you up-to-date on the latest developments in the field of technology designed to assist individuals with disabilities and special needs. I’m your host, Josh Anderson, with the INDATA Project at Easter Seals Crossroads in beautiful Indianapolis, Indiana. 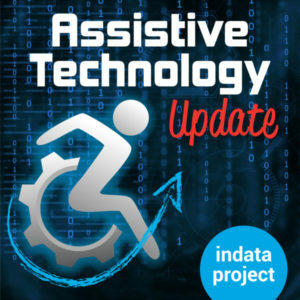 Welcome to episode 399 of Assistive Technology Update. It’s scheduled to be released on January 18, 2019. On today’s show, we are very excited to have Željko Khermayer on. He is the CEO of Feelif, and he is on to talk about that product and how it can help out individuals with visual impairments. I also have a pretty neat story about a new app for the blind and visually impaired that is able to read emotions and make sounds related to that. Also, just as a help to get you through the new year and those resolutions, we are going back to listen to a couple of different BridgingApps app worth mentioning to help you save money or eat better. We are also very excited around here to be attending ATIA at the end of the month. I will be down there hopefully getting some interviews and finding out some new products, some new assistive technology that is coming down the pipeline. Make sure to check out the show in February as we will have some live broadcast from down there — live on tape, I suppose. Thank you for joining us again, and let’s get on with the show. Are you looking for more podcast to listen to? Do you have questions about assistive technology? About an accommodation or maybe how something works? Are you really busy and only have a minute to listen to podcasts? Guess what, you’re in luck because we have a few other podcast you should really check out. The first one is Assistive Technology Frequently Asked Questions, or ATFAQ, hosted by Brian Norton and featuring myself, Belva Smith, and a bunch of other guests. What we do is sit around and take questions about assistive technology, either by accommodations, different things that are out there or different ways to use things. We get those questions from Twitter, online, on the phone, and many other ways. We are also trying to build a community as sometimes, believe it or not, we don’t have all the answers, so we reach out to you to get those answers and help us along. You can check that out anywhere you get your podcasts and wherever you find this podcast. We also have Accessibility Minute. Accessibility Minute is hosted by Laura Metalf. if you’ve never heard her voice, it is smooth as silk. You should really listen to that podcast. She’s going to give you a one minute blurb about some different kinds of assistive technology, kind of what your whistle a little bit and let you know some of the new things that are out there so that you can find out more about them yourself. Check out our other shows, Assistive Technology Frequently Asked Questions and accessibility minutes, available wherever you get your podcast. It seems like there is always a lot of new apps and new accessibility features coming out to cell phones point we take a lot of time here to talk about iPhones, iOS spirit we talk a lot about Google, Google play store. But one company we don’t talk about much is Huawei — and I’m probably mispronouncing that — the Chinese phone manufacturer, H-U-A-W-E-I. one of the biggest phone manufacturers in the world. But they have a new app that can actually read emotions on individuals faces. They call the app Facing Emotions. Basically what the user does is they take their phone, pointed at a person’s face, and it will actually sit there and read that emotion back to them point it plays a sound associated with that. So it doesn’t say happy or sad, but instead plays a noise that was developed by a blind composer. It can recognize seven types of emotions: happiness, surprise, sadness, fear, anger, contempt, and disgust. I don’t know if I always want to know that people have those looks on their faces, but it could be really helpful to be able to do that. It’s only available for one of their phones, the Mate 20 Pro. They say it’s available for that one due to the processor and the camera, but of course it could end up being rolled up for others. It’s a play on the Google play store if you would happen to have the device. Not only does it play the noise but also shows a picture that is either yellow on black or black and yellow, very high contrast in order to help an individual who may be have a visual impairment to be able to see those nuances in the different things on the person’s face. I could see where this could be helpful for individuals with autism or anything else, or any other kind of disability where the individual has a problem with social cues or with reading those. I will put a couple of links in the show notes so that you can read about it. A very cool way to use AI. It also says that it works in off-line mode, so it doesn’t even have to be connected to the Internet to do it. Another neat thing in the story, it talks about how the company has worked to develop a very special holder for their phone to help the blind and visually impaired, kind of a lanyard style, very easy to hold, easy to aim in order to get more access. It seems like there’s always something new coming out, new apps and things to help the blind and visually impaired. We are always very excited to read about them. Check our show notes. Here we are in the third week of January. How many of you have already given up on those New Year’s resolutions? My New Year’s resolution a few years ago was to stop doing New Year’s resolutions, and so far I’ve been sticking to that pretty well. To help you out with those New Year’s resolutions, we are going to go back in time a little bit to a couple of our BridgingApps segments. A lot of folks want to either eat better or lose weight, and a lot of folks want to save money. So we went back in our archives and found a couple of apps worth mentioning that deal with saving money and eating more vegetables. We’re going to have a me very take it away here and tell us about a couple of apps worth mentioning to help you reach those New Year’s resolution goals. AMY BARRY: This is Amy Barry with BridgingApps, and this is an app worth mentioning. This week’s featured app is called Clarity Money. Clarity Money is a free app to help you save money, plan your budget, check your spending and expenses, keep watch on your credit score, and manage all of your linked accounts in one easy place. Clarity Money allows users to connect to their banking institution. This feature should always be approached with caution as it is delicate information. Clarity Money is solid and secure. Our users have peace of mind when connecting to their bank institutions to track financial information. We consider this app a great tool for tracking and creating a budget. When it is connected to your bank institution, they will catalog your activity. This will show your balance, charges, deposits, and there are several sections that display your transactions differently. One of the most useful sections is labeled as spending for the month. This section gives a breakdown on what has been spent in certain categories. Categories include food, health, travel, shopping, bills. This serves as a great tool to reference the user spending habits. A highlight feature of the app is the savings section. This allows you to set up a savings goal and automate the process. Goals can be set with specific targets such as occasion, and you have the control as to when a set dollar amount will be set aside. For example, you may set five dollars every week to be moved into your savings account. The account which is used may be a savings account you already possess from a banking institution, or you may use the option to create a savings account in the app. Clarity Money app’s savings account is FDIC insured and is connected with the Wells Fargo Bank. We found Clarity Money to be an easy to use financial tool. The app is useful in creating a reasonable budget, as it helps the user learn their spending and saving habits. This app takes a security very seriously, and we are comfortable connecting our banking information to track progress. Clarity Money may benefit young adults during transition, veterans, older adults, individuals who struggle with saving money, and more. Clarity Money is available for free at the iTunes and Google Play Store. The app is compatible with iOS and Android devices. For more information on this app and others like it, visit BridgingApps.org. AMY BARRY: This is Amy Barry with BridgingApps, and this is an app worth mentioning. This week’s featured app is called Vegout. Creative use of technology can have a hand in encouraging and supporting vegetable consumption. Yes, vegetable consumption. One such example is the Vegout app from the nonprofit organization Recipe For Success. It is not just any tracker app. It’s an all out interactive challenge that puts discovery of new food and the nutrition concept of variety into a fun, digital format. We know this: one of the most effective route for dietary behavior change is through positive experiences and interactions with a desired food. During nutrition education opportunities, taking the culinary angle surpasses the nutrient fact dialogue in both excitement level, motivation, and fun. The app takes the culinary approach to increasing vegetable intake with a simple challenge. Every month, 30 days, eat 30 different vegetables. Use the Vegout app to log the vegetables consumed and seek information and recipes about vegetables that may have never been on one’s radar. Yes, eat carrots, tomatoes, corn, but expand past of those to try parsnips, black beans, zucchini, and more. Start a group challenge with your family, your workplace, or in the classroom, to really make it fun and impactful experience. Find fun new recipes and share yours with the Vegout community. BridgingApps registered dietitian loved using Vegout as an experienced during a hands-on cooking class program called project High Five, designed for children with special needs. The kids had fun at the end of class recalling and counting all of the different vegetables they interacted with while making the two class recipes. It’s all about eating more with no restrictive tone needed when it comes to encouraging a plan to base a diet rich in vegetables. The Vegout app is a favorite BridgingApps. It’s great for all ages and abilities, but we see its potential for impact with persons in the special needs community. Vegout is available for free at the iTunes and Google Play stores and is compatible with iOS and Android devices. For more information on this app and others like it, visit BridgingApps.org. JOSH ANDERSON: So some individuals out there learn, play, and work better when they can access the world through touch. If we think about all the lack of tactile access that one might experience when using a tablet or the touchscreen device, it can limit the usefulness and limit how we can access those things point our guest today is working to change that. Željko Khermayer is the CEO of Feelif and is here to talk all about it point welcome to the show. ŽELJKO KHERMAYER: Thank you, Josh. JOSH ANDERSON: If you could, go ahead and start us off by telling us a little bit about yourself. ŽELJKO KHERMAYER: I am an innovator, entrepreneur, and social entrepreneur. I am running 4WEB, which is a digital company here in Slovenia for almost 19 years. Five years ago, I started two social enterprises. One is a website called Stop Neplačnike, which means Stop Non-Payers. Its aim is to remove companies who are cheating and not paying their bills out of our economy. That website has a huge success. It has 370,000 visitors per month. Keep in mind that we are living in a country that has only 2 million people. Its impact helps to improve things, so things got much better. The second social project is Feelif. JOSH ANDERSON: Very cool. Tell our listeners all about Feelif. ŽELJKO KHERMAYER: That’s why I’m here. ŽELJKO KHERMAYER: First of all, I want to tell you what Feelif does. Feelif enables blind and visually impaired people to feel pictures and shapes on a touchscreen. Feelif uses a special relief overlay which is placed over the touchscreen, and with vibrations, sound, and speech ensures the user knows exactly what is shown on the screen and can visually orient. Without Feelif, blind people were unable to feel pictures and shapes on the touchscreen. Because of that, there was a lot of digital [INAUDIBLE] so Feelif’s goal is to remove that gap. JOSH ANDERSON: How did this idea come about or get started? ŽELJKO KHERMAYER: It started, as I said, five years ago just by me watching a documentary about death blind people in Slovenia. These are people who are deaf and blind at the same time. I was deeply moved when I saw how isolated they are and how they cannot communicate to people remotely because they can only communicate through touch. If they want to communicate remotely through others, they need a device which costs $10,000. Because they are on welfare, they cannot afford it so they just sit at home, alone, and wait for the social worker to bring them food. Because of that, I thought that there must be a way to enable them to use a smart phone, because smart phones are accessible. That’s how I thought of this new technology, because through vibration and this special tactile overlay, deaf and blind people are able to use a smart phone to communicate. That was how technology got developed. And then in 2015, we made [INAUDIBLE] towards the blind people because we realized that there are also blind people who have problems that they cannot access the whole digital content, they couldn’t access pictures and graphs and shapes. Because of that, they are limited in what content they can access, because not everything can be accessed through text to speech conversion. JOSH ANDERSON: Very true. It’s kind of hard to have some things described to you. That’s very nice that they can sit there and feel the things. You guys actually have some different devices available. What are they and what’s the difference between them? ŽELJKO KHERMAYER: We have three devices. Before that, I want to say in what areas we are operating. ŽELJKO KHERMAYER: This Feelif technology, we are implementing it in three directions. First is education, then entertainment, and everyday practical apps. In the field of education, we have developed apps for teaching: graphs, learning braille, drawing, so blind people can draw different colors and send their drawings or email. And of course we developed a special software for teachers which enables them to create tactile books — we call the Feel books — which can then be played on any Feelif device so that teachers can create [INAUDIBLE]. In the field of entertainment, we have developed digital games for blind such as chess, memory, battleship, connect four, snakes and ladders, and so on. In the practical, everyday apps, we created a camera for the blind so blind people could take pictures, and we created a picture gallery app where they can feel pictures. This app also has artificial intelligence embedded in it which describes to the blind person what is on the picture. They have two different modes how they can feel that picture. We also created a plug-in for the browser so when they are using the browser and you have a talkback, the talkback can just say that there is a picture, but then it uses a special gesture that the picture can be opened in the Feelif application where they can feel it and the artificial intelligence describes what’s in it. We have that and also easy phone app for easy dialing. To go back to your first question, what devices we have, we have three devices, three models. We have Feelif Gamer, Creator, and Pro. Gamer is a smart phone. Creator and Pro are tablets. For a gamer, it’s a smart phone that enables the blind person to also play games. It has an app for easy dialing and is meant for adults and also for kids. It also has the Feelif camera and picture gallery installed that they can feel pictures. Then we have Creator, a tablet. It has everything that Gamer has, plus it enables educational content for drawings, for graphs, and learning the Braille alphabet and shapes. Because it’s meant for education and entertainment. Then there is the Pro version. It has everything creator has plus a much better tablet. It is a premium tablet. It has a high-resolution tactile overlay, so oversized shapes can be felt. And it has special software for teachers which enables them to create tactile books, to create lessons for the blind and visually impaired. JOSH ANDERSON: Very cool. It really covers a lot of different areas. How much do these devices cost? ŽELJKO KHERMAYER: The cost depends on the device you choose. Our smart phone, Feelif gamer costs approximately US$800. Feelif creator cost $1700. And Feelif Pro costs US$2800. JOSH ANDERSON: Is there anything in the works right now? What does the future hold for Feelif? ŽELJKO KHERMAYER: For future development, we want to develop a Feelif open platform where other developers and content creators will be able to share and sell their creations to the blind and visually impaired people. That way the whole community benefits from better content. We want to expand the community and to provide better content for the blind and visually impaired. The second thing is we also want to enable the blind to have better access to public institutions such as museums and galleries. Feelif can be used for indoor navigation, show the floor plan and explain where something in the building is. Also they can be committed with audio guides and provides interactive content which will enable people to learn much more about the institution where they are or about artifacts or artwork. JOSH ANDERSON: I could see how that could be very helpful, especially in and Art Museum. You are not really allowed to walk up and touch the sculpture, but if you could have it appear on your device and be able to touch it, that would really be much more interactive and help the individual to see what’s going on. ŽELJKO KHERMAYER: Yes, exactly. Also you can play some interactive content, for instance to tell some interesting story about that artifact. That can help people learn much more about that. JOSH ANDERSON: That could be helpful in a myriad ways. Very good. Tell me a story about someone that has been helped by Feelif, for someone that has used it and has gained access and been able to do more. ŽELJKO KHERMAYER: Okay. The first story that comes to my mind is about a girl, Mia. It took half an hour for parents to prepare everything so she could start doing her geometry homework. With Feelif, she could do it by herself. Now she’s independent. Under the thing which happened is she was here in our office on one occasion. While we were talking to her parents, I saw how she played a game of battleship with her sighted brother together on the same device. That is something that is just appear inclusion. Another thing is there are a lot of kids — we design the game called treasure hunt. We play this games with the kids and also so that sighted people can draw. The point is that there is a map on the Feelif and they had to feel the map and find the treasure on the device. Then they go and find it in the real world. It could be coins or Easter eggs or whatever. What is interesting is when we created this game, we divided the kids into teams, three people in one team and three in another. They were playing it all at the same time. They couldn’t see each other but they could hear each other. Also they started to compete in the two teams. The competition started and that was really interesting. JOSH ANDERSON: That’s great inclusion because it’s folks with disabilities and folks without just playing together and being able to work together. That’s really good. That really helps because we definitely like inclusion here. Is there anything else you can think that we should let our listeners know about the Feelif? ŽELJKO KHERMAYER: [Stutters] JOSH ANDERSON: I know, that’s always the hardest question. ŽELJKO KHERMAYER: For more information, they can go to our website, www.feelif.com, where they can learn much more. We have lots of videos about the events that we organize and about our users. We are also very active on Facebook so they can find lots of content. JOSH ANDERSON: We will definitely put a link in our show notes. Would they be able to go ahead and order the devices through the website as well? ŽELJKO KHERMAYER: Yes, of course they can. We have a webpage with the web shop, and they can order it from there. JOSH ANDERSON: Like I said, we will put that in the show notes so they can easily get to appear thank you so much for taking time out of your day and coming on to talk to us about this great product. Check that out, everyone. Thanks again. ŽELJKO KHERMAYER: Thanks, Josh. Thank you for inviting me. JOSH ANDERSON: Definitely. As things change and you guys get more stuff up-and-coming, maybe we will have you back on the show to talk again. ŽELJKO KHERMAYER: I hope so.